Dozens of items in part two of the Pierre Horwitz Collection will go up for auction at Bonhams in Edinburgh on Wednesday May 1, this after the first part of the sporting collection made a total of £150,000 last October. 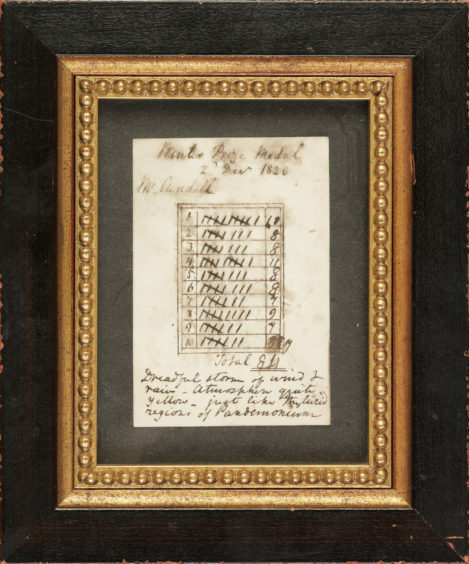 Top of the list is the oldest scorecard in the world, which dates back to December 2 1820 and shows that a Mr Cundell – believed to be James Cundell, who published one of the first ever rule books of golf in 1824 – played the five holes within the Musselburgh Race Track twice, a total of 10 holes in 84 strokes. Charmingly, the golfer provided his own commentary in a handwritten note at the bottom of the card, noting: ‘Dreadful storm of wind and rain – atmosphere quite yellow – just like the lurid regions of Pandemonium’. 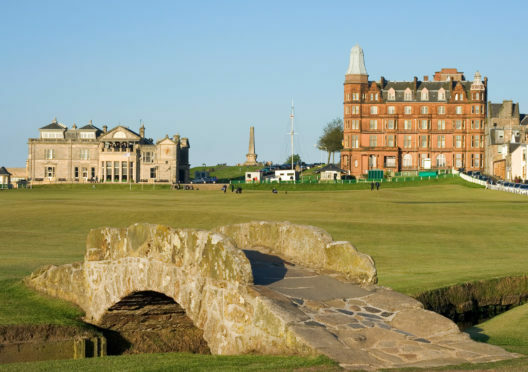 That’s expected to fetch more than £3,500 at auction, although there are a range of other items relating to St Andrews and Dundee’s golfing history which will spark the attention of golf and non-golf lovers. Bonhams golfing memorabilia consultant Kevin McGimpsey said: “This original scorecard is in remarkable condition considering its age and the atrocious weather conditions at the time Mr Cundell played his round. 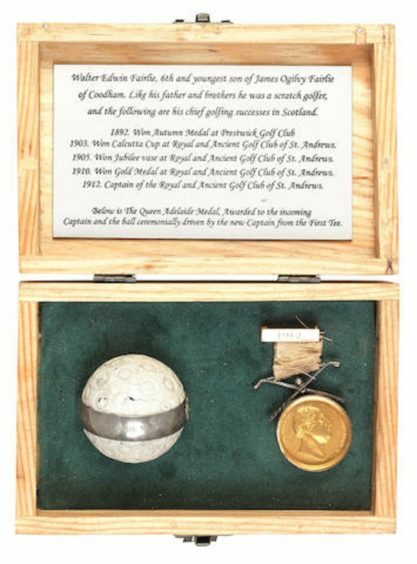 A white painted feather golf ball handmade in around 1840 by St Andrews golfer Allan Robertson, one of the most gifted of the early professional golfers, has been given a £3,000 to £5,000 estimate, while the Royal and Ancient’s Queen Adelaide Gold Medal for 1912 – awarded to the captain when he drove into office – has an estimate of between £2,500 and £3,000. 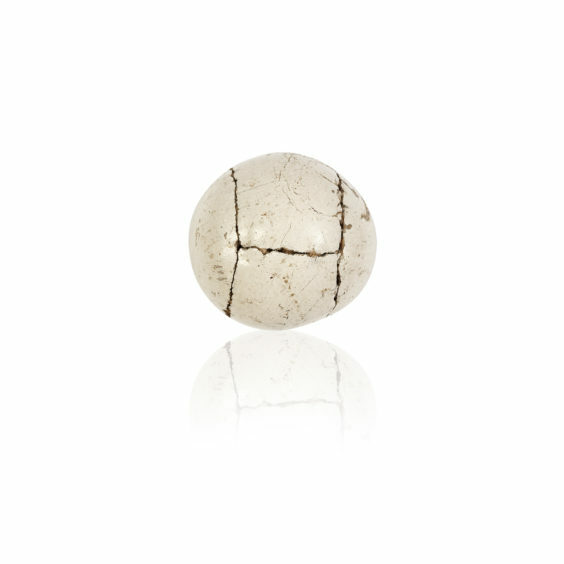 A white painted feather golf ball circa 1840. The R&A medal up for auction. Another intriguing piece is an autograph book from the 1921 Open Golf Championship in St Andrews, which has been given an estimate of £1,500 to £2,000. The rare autograph book going under the hammer. 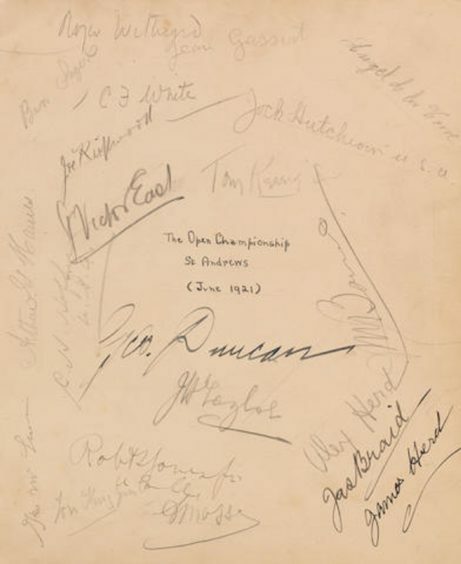 The book has the signatures of both that year’s winner Jock Hutchinson and beaten finalist English amateur Roger Wethered, along with many other players including Robert Jones, who made his debut but tore up his card after taking four to escape from Hell Bunker in the 11th in the third round, James Braid, Alex Herd, James Herd, J.H. Taylor, Jean Gassiat, Arnaud Massy, Tom King, Joe Kirkwood, Arthur Havers, Ben Sayers, George Duncan and Charles Hoffner. The Pierre Horwitz collection covers the period from the early part of the 19th century to the 1920s, and concentrates especially on the manufacture of clubs and balls and rare patented designs of both. There are a range of clubs from various golfers and manufacturers, including a long nosed scared neck putter from around 1856-63 made by famous St Andrews man Robert Forgan which could go for more than £2,000. The Robert Forgan putter listed as part of the auction on May 1. It is stamped, ‘R. Forgan’ on the crown in large letters, and bears his first known mark, a ram’s horn.